In Central Indiana, we're no strangers to severe storms. But, hail, snow, and wind can leave behind a mess, often damaging our property and creating quite a headache. 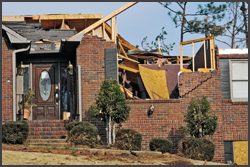 Indy Exterior Services is your go-to contractor for storm damage repair. We've helped thousands of residents in the Central Indiana area clean up their homes, replace hail-damaged roofs, and install new siding and gutters after storms pass through. We know how stressful it can be to learn of damage and deal with insurance companies. We help you through every step of the way, keeping the entire process easy and straightforward. 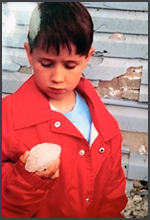 Hail can cause damage to your roof that might not be able to be detected from the ground. At Indy Exterior Services, we get on your roof and physically inspect it for hail damage, and gather the information we need to construct a professional insurance claim. Although damage might seem minimal, hail can create soft spots in your shingles which voids most manufacturers' warranties. It's important to call us before leaks form so we can repair or replace your roof before any major damage occurs. When you put hail and wind together, you have a recipe for disaster when it comes to your exterior: dents, cracks, and chips in your metal, wood, or fiber-cement siding & gutter systems are not just ugly, they leave your home vulnerable to moisture. Indy Exterior Services can come to your home and assess the amount damage hail and wind had on your siding and gutter system. We can replace or repair siding and gutters as needed to keep your home looking beautiful and protected from the elements. We know that dealing with insurance adjusters and making a storm damage insurance claim can be a bit stressful. We're here for you. Indy Exterior Services will work with you and your insurance adjuster to ensure the entire claims process goes quickly and smoothly, so we can do what we do best: get your home back to normal. Storms are unpredictable, but your contractor doesn't have to be. Indy Exterior Services is your partner when it comes to storm damage repair and we look forward to working with you. 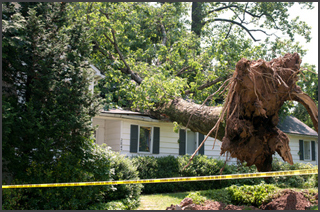 We'll help you get your home back to normal in the aftermath of severe storms. Please call our Central Indiana-based office at (317) 965-2295 for a free, no pressure storm damage inspection and assessment.